Bāguàzhǎng is one of the major "internal" (a.k.a. Nèijiā) Chinese martial arts. Bāguà zhǎng literally means "eight trigram palm," referring to the trigrams of the I Ching (Yijing), one of the canons of Taoism. The creation of Baguazhang, as a formalised martial art, is attributed to Dong Haichuan (董海川) in the early 19th century, who apparently learned from Taoist, and possibly Buddhist, masters in the mountains of rural China. There is evidence to suggest a synthesis of several pre-existing martial arts taught and practised in the region in which he lived, combined with Taoist circle walking. Because of his work as a servant in the Imperial Palace, he impressed the emperor with his graceful movements and his skill at martial arts and became an instructor and a body guard to the court. Dong Haichuan taught for many years in Beijing, eventually earning patronage by the Imperial court. Famous disciples of Dong to become teachers were Fu Chen Sung (傅振嵩), Yin Fu (尹福), Cheng Tinghua (程廷華), Song Changrong (宋長榮), Liu Fengchun (劉鳳春), Ma Weiqi (馬維棋), Liang Zhenpu(梁振蒲) and Liu Dekuan (刘德宽). Although they were all students of the same teacher, their methods of training and expressions of palm techniques differed. The Cheng and Liu styles are said to specialize in "Pushing" the palms, Yin style is known for "Threading" the palms, Song's followers practice "Plum Flower" (梅花 Mei Hua) palm technique and Ma style palms are known as "Hammers." Some of Dong Haichuan's students, including Cheng Tinghua, participated in the Boxer Rebellion. In general, most Bagua practitioners practice either the Yin (尹), Cheng (程), or Liang (梁) styles of Baguazhang, although Fan (樊), Shi (史), Liu (劉), Fu (傅), and other styles also exist. (The Liu style is a special case, in that it is rarely practiced alone, but as a complement to other styles.) In addition, there are substyles of the above styles as well, such as the Sun (孫), Gao (高), and Jiang (姜) styles, which are substyles of Cheng style. Internalist Zhang Zhaodong, also known as Zhang Zhankui. 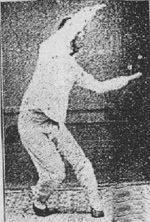 The practice of circle walking, or 'Turning the Circle', as it is sometimes called, is baguazhang's characteristic method of stance and movement training. For a beginner the circle is six to twelve feet in diameter. Practitioners walk around the edge of the circle in various low stances, facing the center, and periodically change direction as they execute forms. Students first learn flexibility and proper body alignment through such exercises, then move on to more complex forms and internal power mechanics. The internal aspects of baguazhang are similar to, yet distinct from, those of Xingyi and Tai Chi. Many distinctive styles of weapons are contained within baguazhang, some use concealment like the "scholar's pen" or a pair of knives (the most elaborate which are unique to the style are the crescent-shaped deer horn knives). Baguazhang is also known for practicing with extremely large weapons, such as the Bāguàjian (八卦劍) or 'Bagua Sword' and Bāguàdāo (八卦刀) or 'Bagua Broadsword'. Other more conventional weapons are also used like the staff (gun), the spear (qiang), the crutch (guai), the hook sword (gou) and the straight (double-edged) sword. Baguazhang practitioners are also known for being able to use anything as a weapon using the principles of their art. Baguazhang contains an extremely wide variety of techniques, including various strikes (with palm, fist, elbow, fingers etc), low kicks, joint locking techniques, throws, and distinctively evasive circular footwork. The Baguazhang practitioner are known for their ability to "flow" in and out of the way of objects. This is where the theory of being able to fight multiple attackers came into view. Strict Baguazhang teaches that if you are to defeat more than one opponent you must first learn to quickly eliminate an opponent with fast and effective joint locks, knockouts, breaks, and other form of physical trauma. Under close examination, Baguazhang can be compared to a form of above ground wrestling. Many of wrestling's philosophies are very similar to Baguazhang's. ^ Lie, Zhang. “Classical Baguazhang Volume V: Yin Style Baguazhang.” Trans. Joseph Crandall. Pinole, California: Smiling Tiger Martial Arts 1995. ^ Yintao, Fei and Yuliang, Fei. “Classical Baguazhang Volume IV: Wudang Baguazhang.” Trans. Joseph Crandall. Pinole, California: Smiling Tiger Martial Arts 1994. ^ Jingru, Liu and Youqing, Ma. “Classical Baguazhang Volume II: Cheng Shi Baguazhang (Cheng Family Baguazhang).” Trans. Joseph Crandall. Pinole, California: Smiling Tiger Martial Arts 2001. Martial arts are listed by area of primary focus. Note that they may include training in the other areas. This page was last modified on 30 March 2009, at 10:03.